One of Walpole’s many pins. Wellesley senior captain Hudson Sewall works for the takedown. In a 49-12 victor over Wellesley High School, the Walpole Rebels wrestling team managed to show their superior skills, as well as their humility and class. Walpole knew that they were facing a shorthanded Wellesley squad and opted to take a couple of “no contests” rather than run up the score against a hobbled opponent. 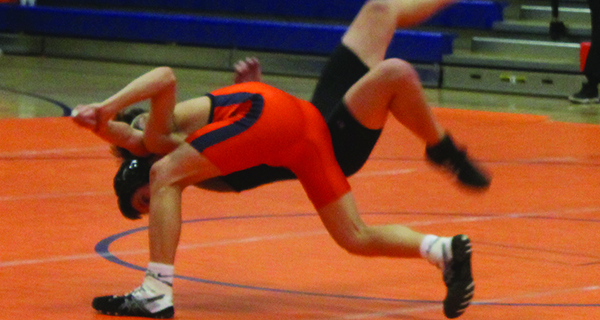 With all due to respect to Wellesley, Walpole’s wrestlers were too much for them all night. Borelli’s win was followed up by a close-points victory by Walpole’s 126 lb wrestler, Connor Hope, who is also a black belt in karate. Joe Servello also had a nice win over Wellesley’s Sophie Laing, but Laing deserves credit for lasting as long as she did, considering she had to survive two referee warnings after Servello twisted her arm too far, and a slam onto the mat that had the crowd letting out a sympathetic “ooh.” Heavyweight Manny Rosado added another quick pin, as did four-sport athlete Henry Morris. 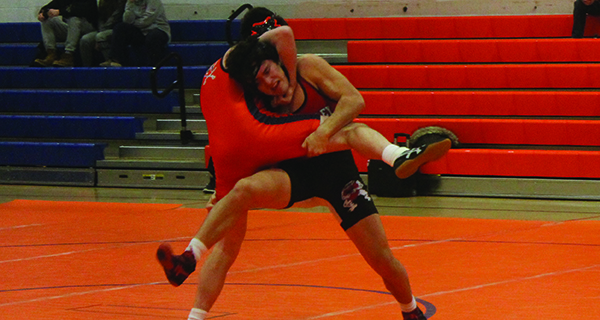 For Borelli, however, the standout performance was John Shea’s pin, which came at a perfect time for the young wrestler. In a night of lows for Wellesley, senior captain Hudson Sewall’s ultra-tight, last minute victory over Colin Hile stood out as a high point. In fairness to Hile, Sewall is a senior captain while Hile is just a sophomore - Walpole’s team is incredibly young, with zero seniors, nine juniors, ten sophomores, and four freshmen on the roster. The team is so young that Borelli actually recruited some of the freshman, but found one unexpected issue in doing so: the youngest athletes weren’t happy about showing so much skin. This slam from Walpole’s Joe Servello got a strong crowd reaction in the Rebels’ 49-12 wrestling victory over Wellesley. It’s a good time for Walpole’s team to get stronger and stronger, because while their record stands at 8-6-2, they’re heading into the most important part of the season.